Pattern: The specks are strung together, forming parallel streaks. 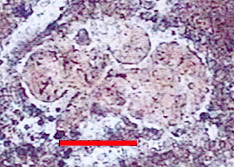 Appearance: Centre is homogeneous, while outer parts are poorly silicified. Structure: Arrangement of grains distinctly more fluidal, numerous recrystallized zones. Grains: 20 to 25 %, mean size 100 to 300 µ, greater frequency of fuzzy 1000 µ elements (sponge conjunctive tissue ? 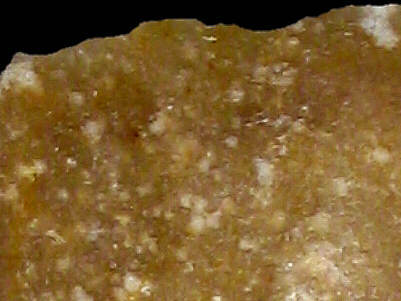 ), high degree of micritization, more recrystallization haloes. Grain composition: Fewer sponge spicules, generally thin-walled ; fewer foraminifera, and only globose species (Globigerinelloides sp., Hedbergella planispira, Archaeoglobigerina sp.). Determination: M. Caron, Université de Fribourg. Geographical description: The material was collected on a steep hillside adjacent to the road that connects the village of Leyssard with the main D 979. Geology: According to the geological map, the parent rock belongs to unit C6 (Late Cretaceous, Senonian). 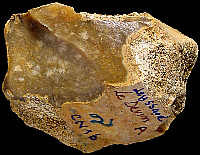 Other types of flint: All flint in this locality is of the CN1b variety. Geographical description: The sampling site is located just above some hairpin-bends in the narrow road which connects the village of Leyssard with the main road D 979. Nearby there also is a path which goes from the mentioned hairpin-bends in the direction of Sonthonnax-le-Vignoble to the west. Co-ordinate precision: As usual, the French Lambert-values were taken off a large-scale topographical map and the geographical coordinates were calculated directly by transforming those values on WGS84. The precision of both are within 50 metres. Geology: According to the geological map, the substrate consists of clays-with-flints (Rs), which are the residues of dissolved/decalcified Late Cretaceous formations (C6). Other types of flint: The residual loams on this location contain also CN1a and CN2b flint.